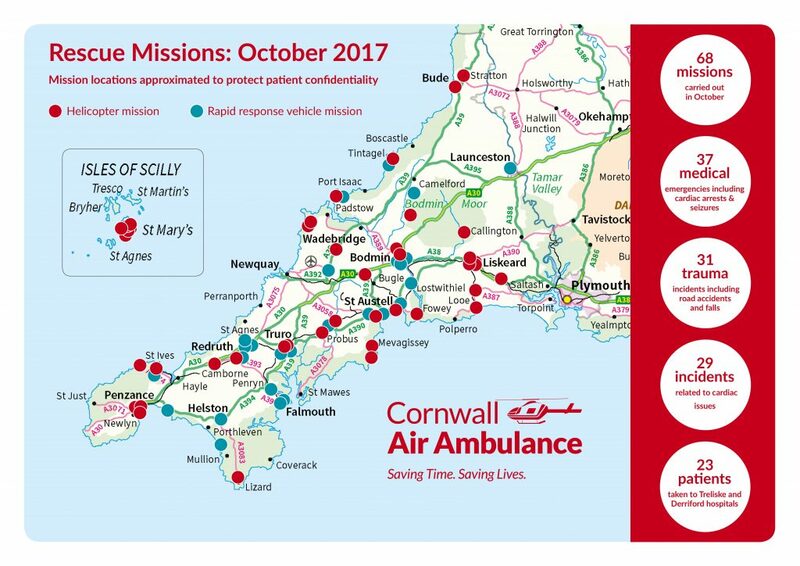 October saw the Cornwall Air Ambulance crew carry out 68 missions to people in need of urgent medical care throughout Cornwall and the Isles of Scilly. Throughout October a total of 42 missions were flown in the air ambulance helicopters and 26 were carried out using the charity’s critical care cars. Medical emergencies accounted for 37 missions, including 19 people suffering from heart related problems. There were also 31 missions to people who suffered serious injuries, including 10 serious trips and falls and six road traffic collisions. Near Mullion – a man suffered a head injury after an incident with an overturned truck. The crew treated him on scene before he was taken to hospital by land ambulance. Near Newquay – a woman suffered a head injury after an incident while horse riding. She was treated at the scene before being air lifted to Treliske Hospital for further treatment. Near Liskeard – a man suffered a severe leg injury when a wooden pallet fell on him. He was treated on scene before being taken to Derriford Hospital. Each year, the crew of Cornwall of Air Ambulance carries out more than 700 lifesaving missions. The charity doesn’t receive any government funding towards its running costs and so relies on donations to carry out its work.